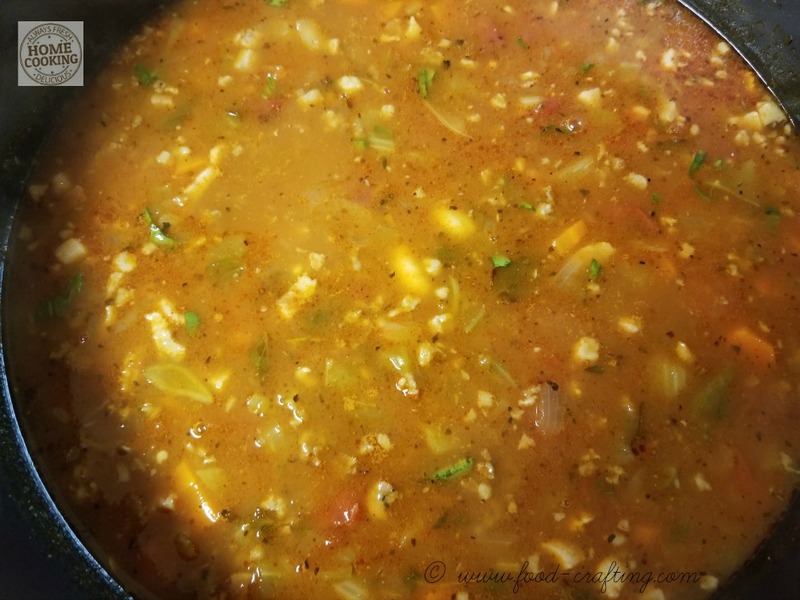 Italian Pasta E Fagioli Soup – Admit it. Garlic bread is the best side to have with a huge bowl of fresh soup. This first day of Fall brings memories of quick trips to the scenic Italian seaside town of Trieste. And Trieste means some of the best soups I’ve ever eaten – Minestrone or Pasta E Fagioli, topped with freshly grated Parmesan. 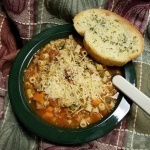 Italian Pasta E Fagioli Soup As A Copy Cat Recipe or What I Remember? Along with the bowl of soup, waiters brought baskets of freshly baked bread or a bowl full of pungent garlic bread. You know, the kind of garlic bread you can smell as they walk out of the trattoria kitchen towards your table! And who turns their nose up at garlic bread? Not I. In a hurry? ==> Read the recipe later or Save the pin now. Pasta e Fagioli (aka Pasta e fazule or even commonly referred to as “Pasta Fazool” ) is basically a country-style pasta and bean stew. The beauty of it is that you can easily adjust the recipe to make it soup by adding more broth. As long as you include ditalini and cannellini beans, you are good to go. 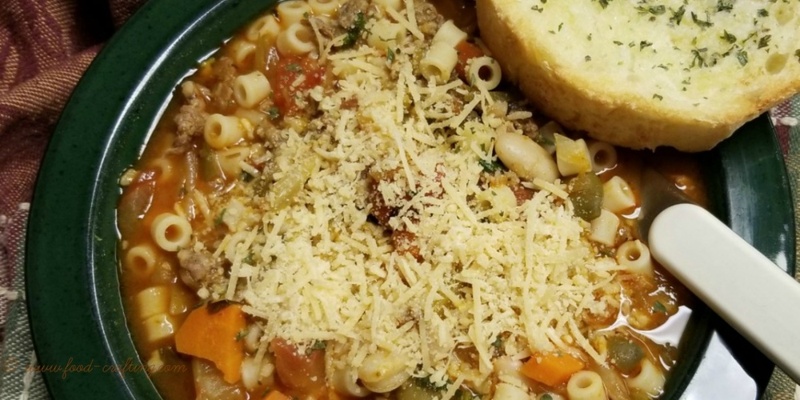 This is the way I remember it best – less as the Olive Garden® pasta e Fagioli soup but more like a soup. With sausage in it. Yes, it’s been a few years. But certain dishes become etched on your taste buds regardless of passing time. 2 large sprigs of fresh basil, one chopped fine to add to the veggies and 1 cut en chiffonade to add a punch of fresh flavor to the soup. Fresh oregano – leaves from 2 stems. In a large, heavy bottom frying pan, add the bulk sausage and break up into the smallest pieces possible. I use this great kitchen gadget for this purpose. On low heat, cook through until done but do not burn the meat. Remove to a double layer paper towel using a slotted spoon and set aside. In a large Dutch oven, sauté the pancetta on low heat. 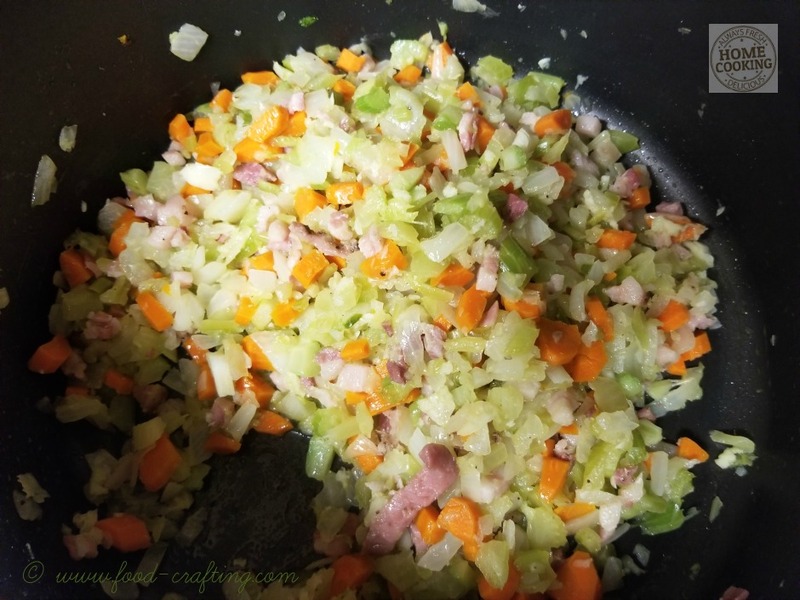 To the pancetta, add the chopped onions and celery plus the diced carrots. Sauté for about 8 minutes over low heat until the onions are translucent. At this point, add one sprig of chopped fresh basil. Add the minced fresh garlic and sauté for a couple more minutes. Mix the vegetables to combine evenly. Add the tomato sauce and the diced tomatoes. Season with the fresh herbs – I stripped the leaves from the thyme and gave the oregano and basil leaves a rough chop. Add the dried herbs to the soup mixture. Add one container of chicken stock plus half of the second container – just enough to cover the vegetables. I intended on putting away two containers of soup for my Mom so I increased the liquid to correspond to the extra ingredients. Combine the vegetables and stock to mix evenly. Set soup to simmer for about 50 minutes. Just before serving-first, add sausage to heat through then add the beans to also heat through. To Serve: In a large soup bowl, add a ladle full of cooked pasta. Top with hot soup. Garnish with Parmesan. Serve with a salad and hot, homemade garlic bread. Don’t Let The Long List of Ingredients Keep You From Making This Soup From Scratch! Sure, you can purchase this soup ready-made or as “dried mixes”. Don’t go there. The fresh soup tastes so much better than anything prepared and packaged! Pasta e Fagioli (much like Minestrone soup) also qualifies as the perfect pantry/fridge clearing soup! I prepared Italian green beans for dinner the previous night. The leftover green beans were chopped and added to the soup. Why use the grease from cooked sausage when you can substitute that fat with pancetta? Everything tastes better with bacon or in this case pancetta. We’re talking Italian all the way through. A four-ounce cell pack of pancetta is just enough to provide a little fat (and molto gusto) to the sautéed vegetables. A bottle of light flavored oil for salads. If you don’t care for the intense olive oil flavor, buy a small bottle or even one of the roasted garlic infused for cooking. I’m getting hungry now. The soup has simmered and I’ve added the sausage bits and the cannellini beans. We’re just about ready for dinner. The only thing left to do is butter the thick slices of bread and toast them to a delicate crisp. Soup can be prepared in a variety of pans but my favorite pan for soup is a 7 quart enameled cast iron Dutch Oven. These heavy-duty pans are marvels and perfect for soups, stews and any recipe that requires slow and low cooking. Plus… they come in assorted colors to match any kitchen decor. Here is my favorite color. The interior finish of this pan allows me to sauté meats to perfection. Add the heavy lid with its condensation bumps and finish braising a stew or a roast in the oven. The best feature is that the Staub® pan will work on any cooking surface – including induction and halogen. It is equally perfect for the stovetop preparation of soup! Once the lid is on, you are not likely to have much if any liquid evaporate during the cooking process. The other kitchen tool which I find to be useful for a great many tasks is the garlic grater. Fresh garlic is a must in my kitchen and depending on the recipe, I crush, mince, chop or grate the garlic to best fit the recipe. You want the dish to have the flavor of garlic rather than find yourself biting into a clove of garlic. For soup, I find that grated garlic works best. As with a mandoline, use the proper tool to grate the garlic. Garlic cloves are nearly impossible to hold securely and grate properly on a regular sized grater and you definitely do not want your fingertips to get too close to the blades. Buy and wear cut resistant gloves! Almost Forgot About The Garlic Butter! Not sure why I did not think of this before but I was borderline ravenous by the time the soup was ready. My garlic butter is normally a time-consuming thing; I chop fresh parsley, crush the garlic, soften the butter then add Maldon sea salt flakes. A little salty crunch in the garlic butter is what I aim for. After mixing all the ingredients together, I season to taste and allow the butter to absorb all that garlicky flavor. It sits in the fridge for hours. Often, I prepare the garlic butter the day before! Here is a real time saver! Buy a tub of quality soft butter. Any butter but I cook with this butter so I purchased a tub of their salted butter. Allow the butter to sit at room temperature while you prepare the soup. Mind you, I never use proportions when making garlic butter. It simply has to taste right. Mince as much fresh garlic as you can stand – add it directly to the tub of butter. Chop some fresh herbs (I used dried parsley here but added finely chopped basil instead) and add them to the butter. You can add parmesan but this is totally optional. Personally, I do not add cheese. Season to taste and blend well. Ecco! We’ll call it burro all’aglio but just for today. As I mentioned earlier, I like the sea salt crunch and you have to be able to immediately identify it as du beurre à l’ail! 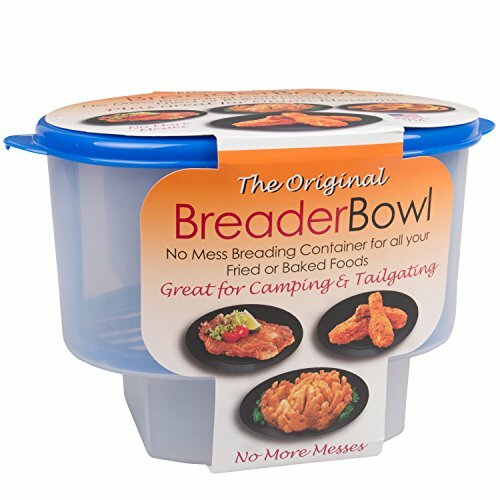 The best thing about this little time saver is that you can pop the lid back on the tub of butter and keep it in the fridge until you just have to have another slice of garlic bread. Yes, it is easy to buy ready-made garlic butter (this is the best by far!) but it is just as easy to prepare it from scratch. This way you control the amount of garlic, herbs, and salt in the compound butter. 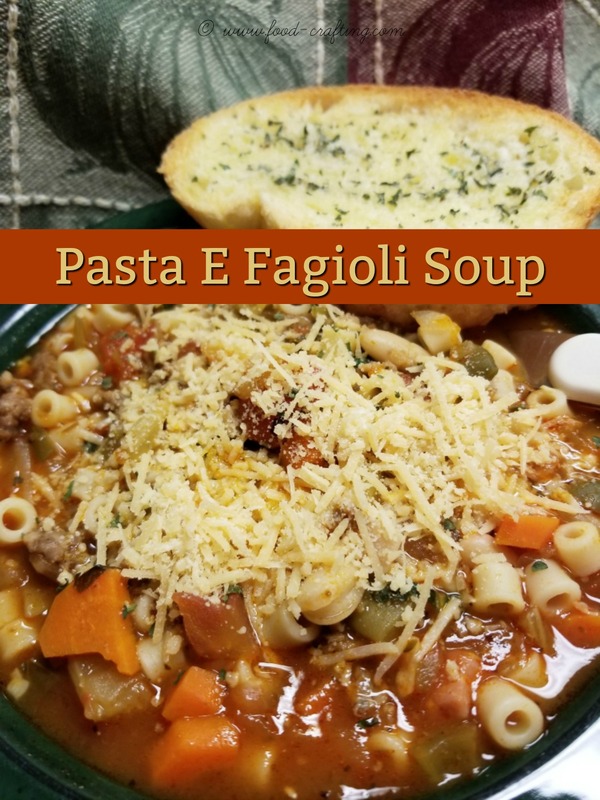 1 Italian Pasta E Fagioli Soup As A Copy Cat Recipe or What I Remember? 2.5 Don’t Let The Long List of Ingredients Keep You From Making This Soup From Scratch! 2.7 Almost Forgot About The Garlic Butter! 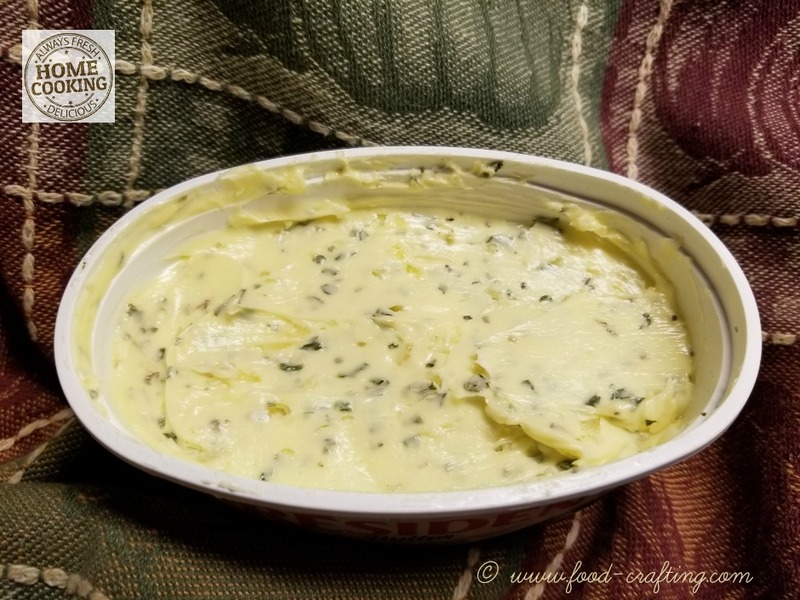 2.8 Garlic Butter Time Saver!